The father of a murdered teenager from Leicester is preparing to take legal action against the publishers of a video game. Stefan Pakeerah, 14, was killed in February by his friend, Warren LeBlanc, who stabbed him in a park. 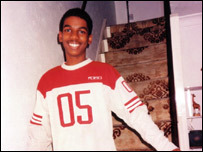 Patrick Pakeerah fears LeBlanc was inspired by the game Manhunt - but no link was proven in court. He now wants to test whether the publishers of the game fulfilled their duty of care. Mr Pakeerah's lawyer, Martin Day, said: "It is clear there is a difference of view as you would expect. "What he is trying to prove as claimant in the case is on the balance of probability has this game brought about Stefan's death and I think we have got a fair chance of proving that." Leicestershire Police said after the trial that robbery was the motive behind the attack, and not the game. Manhunt's maker Rockstar North said at the time its games were geared towards mature audiences and that it marketed its games responsibly.